Hands down, one of the best fall flavors has got to be pumpkin. Hands. Down. Especially when it’s mixed with delicious spices. Many scrumptious autumnal recipes – such as the classic Thanksgiving staple, pumpkin pie – often call for a can of two of pumpkin puree. I’ve used the canned puree before – Trader Joe’s Organic Pumpkin Puree, to be exact – and it works just fine and tastes great. However, since I tend to favor homemade ingredients over those that come in a can, jar, or frozen package – as a matter of personal preference – I set out to find an easy recipe for homemade pumpkin puree. Turns out, it’s much easier than I initially thought, and it can be made ahead of time and stored in the fridge or even in the freezer. 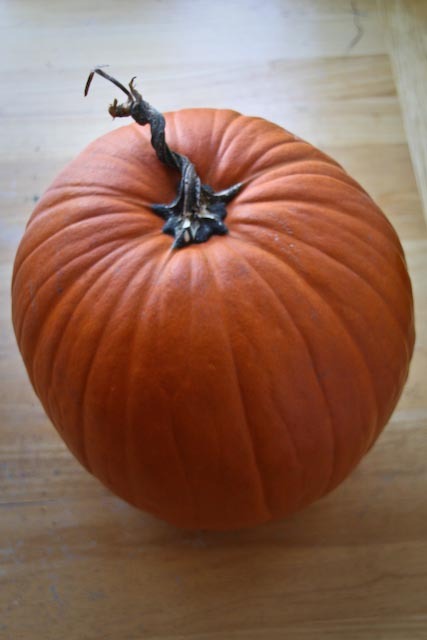 Many people suggest baking and pureeing a sugar pumpkin, which is the jack-o-lantern’s smaller, slightly sweeter cousin. I’ve made puree like this with both sugar pumpkins and the carving varieties. They both taste great and work quite well in recipes. The sugar pumpkin had a bit more moisture and didn’t need additional water, whereas the larger pumpkin I used for this puree was a bit dry. Have an extra, un-carved pumpkin lying around? Notice some extremely cheap post-Halloween pumpkins on sale at the grocery store? Make some pumpkin puree! 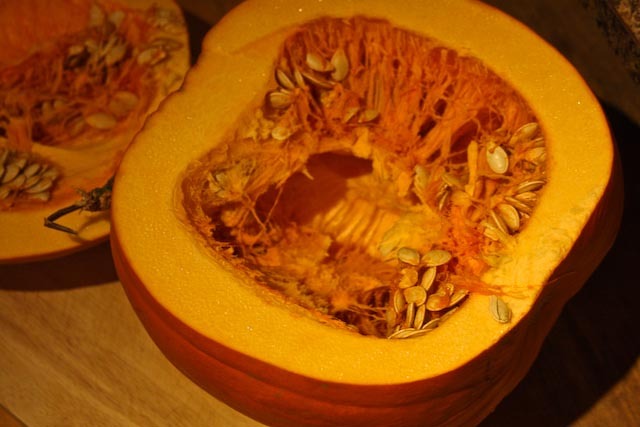 All you need to do is scrape the seeds and pulp from your pumpkin (save the seeds if you like to bake them! 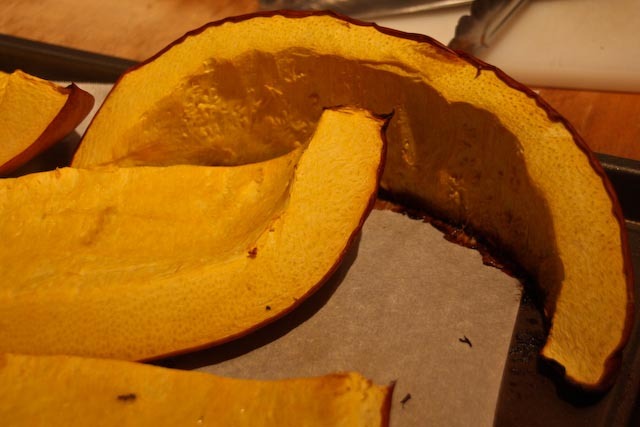 ), and cut the pumpkin into smaller pieces for easy roasting. I roasted the pumpkin on parchment paper for about 45 minutes (the time may vary depending on the size of the pumpkin), until the pumpkin meat was tender but not mushy. 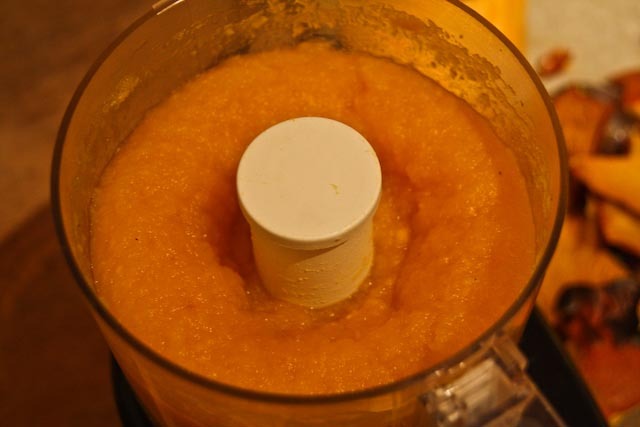 Once cooled, the pumpkin flesh is pureed to a think orange pulp in a food processor or blender. My pumpkin happened to be a bit dry, so I had to add a few tablespoons of water to the food processor in order to get a viscous, but still smooth and workable, texture. If your pumpkin puree turns out a bit soggy, you can strain it through a bowl lined with cheese cloth or a colander lined with paper towel. One medium size pumpkin made several cups of puree, which I plan to use in soup, pumpkin bread, and as many other delicious fall treats as I can! Preheat oven to 375°F. Cut pumpkin into eight to ten smaller wedges and discard the stem. Place wedges onto a baking sheet (preferably lined with parchment paper) and bake for approximately 45 minutes, until tender (you should be able to easily prick the flesh with a fork; baking time may vary depending on the size of your pumpkin). Let cool for a while, and then scrape the pumpkin flesh from the skin into a food processor or blender. Puree in batches until the mixture is thick but smooth. Depending on the type and size of the pumpkin, the puree may be a bit too wet or too dry. If too dry (and difficult to blend), add a tablespoon of water at a time until you reach the desired consistency. If too wet, strain the puree through a bowl lined with cheesecloth or a colander or strainer lined with paper towel. Use in recipes that call for canned pumpkin puree (not pumpkin pie filling! ); the same quantities should work just fine.